Overseas Flights: 1956, 31 Jan. / 1956, 24 Feb. / 1956, 20 Mar. Extension of main trunk route by NZNAC using Douglas DC-3 following the up-grading of Invercargill Airport. Although the enlarged and up-graded airport had been in regular use for a week, the official opening was not held until the 21st. Some covers with typed inscriptions were included in the mall flown out on the regular scheduled DC-3 service after the ceremony. Overseas Flights: 1956, 13 Aug. / 1956, 16 Oct. / 1956, 19 Oct.
Inaugural flights by West Coast Airways Ltd. with a D.H. Dragon Rapide. West Coast Airways was formed to take over the South Westland route of NZNAC. Special covers were printed in blue and postmarked HOKITIKA 17 November 1956. The return covers were postmarked at Haast on the 19th and backstamped at Hokitika the same day. Overseas Flights: 1956-57, 18, 20 Dec. & 29 Jan. / 1957, 5 Feb. / 1957, 4-9 Feb. / 1957, 18 Mar. / 1957, 26 Mar. When Douglas DC-3 ZK-AZA "Parera" flew from Levels Airport to Christchurch with one bag of mail. Mails from Timaru were backstamped 3.00pm at Christchurch and at 8.00pm at both Wellington and Auckland. Direct service by NZNAC. The service commenced on 25 April but as this was ANZAC Day and a national holiday, no mails were carried until the 27th. Privately printed covers were flown and mails were backstamped Napier 5.00pm and Auckland 9.00pm. Commenced by Trans Island Airways Ltd. Beech D-18, ZK-BQE 'Spirit of North Otago' (Captain B.G. Chadwick) A thrice weekly service linked Nelson-Christchurch-Timaru-Oamaru. An unofficial mail was flown with cachets applied in different colours. Incorporated into NZNAC Douglas DC-3 main trunk route. Covers postmarked TIMARU 27 MY 57 2-PM are backstamped DUNEDIN 27 MY 57 5.30 PM and those posted DUNEDIN 27 MY 57 6-AM are backstamped TIMARU 27 My 57 10AM. Incorporated into NZNAC Douglas DC-3 main trunk route. Mail included privately printed souvenir covers. Overseas Flights: 1957, 10 Sept. / 1957, 1 Oct. / 1957, 15 Oct.
By Sikorsky HRS-3 helicopter as the icebreaker approached Lyttelton Harbour. 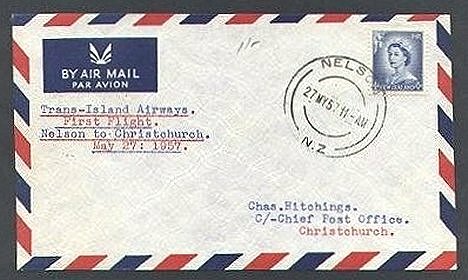 Covers carried have a typed inscription and the US Operation Deep Freeze -Task Force 43 cachet, a US stamp postmarked USS "GLACIER" (AGB-4) NOV 10 1957 and also CHRISTCHURCH 12 NOV 1957 postmark on a NZ stamp. Overseas Flight: 1957, 14 Dec.-1958, 1 Mar. Service by NZNAC Turbo-prop Vickers Viscount ZK-BRD 'City of Wellington' leaving Christchurch at 2.15pm for Auckland and arriving back at 6.45pm. Privately printed souvenir covers were included in the 3,000 items carried. Trans Island Airways introduced Lockheed 1OE Electra ZK-BUT "Spirit of Tasman Bay" (Captain B.G. Chadwick, Captain B. Waugh) to the service, replacing the Beech D-185 ZK-BQE which was laid up. 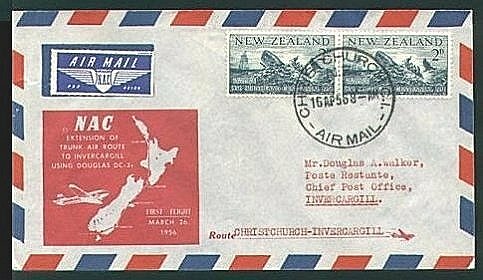 Mail carried included covers postmarked CHRISTCHURCH C.1. 25FE58 8-AM which were backstamped on arrival NELSON 25 FE 58 4-PM. Overseas Flights: 1958, 11 Sept. / 1958, 2 Oct. / 1958, 14 Oct. / 1958, 26 Nov.
NZNAC began a direct service between these places. Overseas Flight: 1959, 1 Apr. NZNAC began a Vickers Viscount service using ZK-BRF "City of Christchurch" (Captain A.C. Kenning). The mail included privately printed souvenir covers postmarked in Christchurch on 6 April at 9.00am and backstamped Palmerston North at 4.30pm on the same day. Tourist Air Travel Ltd. commenced an air mail and passenger service with their Grumman Widgeon, ZK-BGQ. This was the first air mall service to the Island since the Pigeongram service. The old Rongotai Aerodrome had been enlarged and modernised and was now designated as Wellington Airport. The undermentioned NZNAC services possibly carried mail on Opening Day. In conjunction with members of the Nelson Philatelic Society a special mall was organised for members of the Nelson Ski Club. Covers are postmarked NELSON 26 AUG 59 and struck with a framed cachet reading NELSON SKI CLUB - SPECIAL AIR DELIVERY - 26.8.59. Owing to poor visibility the mail was not dropped and covers were returned to Nelson and backstamped NELSON REGISTERED 26AUG59. Overseas Flight: 1959, 15 Oct.-1 Nov.
(formerly Rongotai). Although NZNAC had been flying to and from there since 20 July, 1959, the airport was not officially opened until 24 October. Several printed souvenir covers were produced and a special datestamp supplied by the Post Office was struck on mail posted at the Airport. On "Official Opening Day". Now that Wellington Airport was fully operational, all NZNAC scheduled services, including those carrying mail which previously flew via Paraparaumu, arrived and departed from the "new" airport. (See also 20 July, 1959). Overseas Flight: 1959, 4 Nov. / 1959, 1-7 Dec.
40th Anniversary flight commemorating the First New Zealand Official Air Mail flown by George Bolt in Walsh Bros. & Dexters Boeing Seaplane. Special flight by Tourist Air Travel Ltd. Grumman Widgeon amphibian ZK-BGQ piloted by Captain Fred Ladd with Mr. George Bolt, organised by the Air Mail Society of N.Z. in conjunction with the N.Z. Division of the Royal Aeronautical Society. 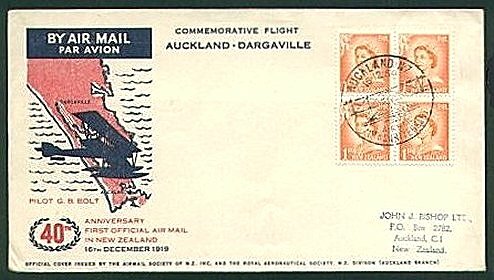 Souvenir covers were produced by the Air mail Society and two pictorial datestamps [one for each flight] were used at Auckland and Dargaville and as backstamps. A sheetlet of six vignettes [based on the unaccepted design for a N.Z. Air Mail stamp by R.J.G. Collins and Miss M. Thompson] was also issued, and a quantity of covers have one vignette tied by the Society's seal. Overseas Flights: 1960, 1-6 Jan. / 1960, 25 Jan. / 1960, 2 Feb. / 1960, 5-6 Feb.
Inaugurated by Bay of Plenty Airways Aero Commander 580 Super ZK-BWA. No official mail was carried but a few covers were flown by courtesy. Inaugurated by Bay of Plenty Airways Cessna 182 ZK-BRL No official mail was carried but a few covers were flown by courtesy. Overseas Flights: 1960, 17, 18, 19 July / 1960, 26 July /> 1960, 15 Sept.
2,500 covers were produced to mark the opening, and 1,000 of them were flown by M.W. van der Zanden during the air display and later signed by him. NZNAC Fokker F27-100 Friendship service inaugurated by ZK-BXA "Kuaka". Privately printed souvenir covers were included in the mails. NZNAC Fokker F27-100 Friendship service inaugurated with ZK-BXB "Kotuku" (Captain J.R. Layton). Covers were postmarked at Invercargill on 13 March and incoming covers at that office were backstamped the same day. NZNAC extended the Auckland-Wellington Fokker Friendship service to Invercargill. NZNAC introduced the Fokker Friendship to the Cook Strait route. Overseas Flight: 1961, 30 Apr. Into the Friendship main trunk route. Overseas Flights: 1961, 3-4 Oct. / 1961, 4-5 Oct. / 1961, 4 Oct. / 1961, 7-8 Oct. / 1961, 13 Oct.
For light aircraft was established by Napier Aero Club pilots flying the Club's Piper PA-18A Super Cub ZK-BTW. The attempt began at one minute after midnight on 2 December and ended at 0002 hours on 3 Dec with a flying time of 23 hours and 24 minutes. A small mail of souvenir covers was carried and signed by the 25 pilots and officials involved in the successful attempt World Endurance Record Flights attempt. Overseas Flight: 1961, Dec.-1962, Jan.
Momona, a completely new airport had been constructed to replace Taieri as Dunedin Airport. It was opened on the evening of the 22 May. NZNAC Special Flight SP353 (Christchurch-Dunedin) by Viscount ZK-BWO (Captain A.C. Kenning) arrived on the morning of the 22nd. Mails were flown on scheduled NZNAC services on 23 May with Friendship ZK-BXC making the first flight from Momona on that day. NZNAC Vickers Viscount (Captain AD. Carlaw) first scheduled flight. Overseas Flight: 1963, 2-7 Apr. CRASH OF NZNAC DOUGLAS DC-3 ZK-AYZ "Powhera"
In the Kaimai Range while on a flight from Auckland to Tauranga. All 29 passengers and three crew were killed. 168 pieces of mail were salvaged from the wreckage. Phoenix Airways Ltd commenced a thrice weekly service over the Southern Alps using Piper PA-23 ZK-BLP piloted by MJ. Dunn. A few unofficial covers with typed inscriptions and the Phoenix Airways rubber-stamped cachet were flown each way, posted on arrival and signed by the pilot. The earlier inaugural flights of the service were delayed from the 9th and 11th by bad weather. Service resumed by NZNAC with Fokker Friendship ZK-BXF. This route, previously flown by NZNAC, had been handed over to SPANZ on 31 August 1962 by order of the Civil Aviation Administration. Overseas Flights: 1963, 5 Oct. / 1963, 3 Nov.
Last flight of NZNAC service by D.H. Dominie ZK-AKY "Tui". Overseas Flight: 1964, 10 Feb. The Post Office produced a special slogan machine cancellation reading: HAWKES BAY - AIR SHOW -15th FEB 1964 in three lines. This die was in use from l-6 February at Hastings and from 8-15 February at Napier. By J.W.H. Scotland. The Air Mail Society of N.Z. in conjunction with the Christchurch Air Exposition Committee arranged a re-enactment flight (see next entry) and the Society also produced a commemorative air mail cover. The Post Office supplied a pictorial datestamp which was struck on mail at the Chief Post Office, Timaru. 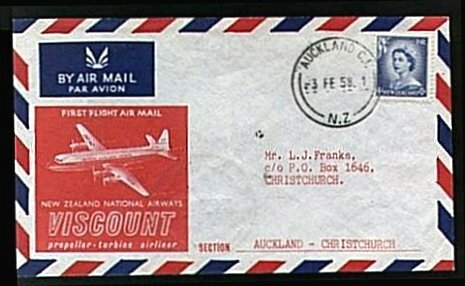 This mail was flown on board the NZNAC DC-3 ZK-AZK "Napier" and was backstamped CHRISTCHURCH AIRPORT 6 MR 64 11AM. John Switzer of the Canterbury Aero Club re-enacted the 1914 flight when he flew his D.H.83 Fox Moth ZK-ASP over J.W.H. Scotland's original route from Timaru to Christchurch. He carried three letters, the fist of which was dropped over Temuka (as Scotland did with a letter in 1914). The second letter was a goodwill message from the Mayor of Timaru to the Mayor of Christchurch, and the third, addressed privately, was posted at the Airport and cancelled CHRISTCHURCH AIRPORT 6 MR 64-2. Overseas Flights: 1964, 17 Mar. / 1964, 17 Mar. NZNAC commenced a Fokker Friendship service from Auckland to Gisborne and return. The new runway enabled the DC-3s on the NZNAC Auckland-Kaitaia service to use Whangarei. Colin Glasgow flying Mooney Super 21 ZK-CFW completed the flight in 6 hours 35 minutes. He circled the North Cape lighthouse at 8.36am and flew over Bluff at 3.11pm after a refuelling stop at Woodbourne. The previous record was held by Cessna 180 ZK-BUF in a time of 7 hours 26 minutes. Souvenir covers were reported.